It’s easy to get caught in a roadblock when deciding on a title for your blog posts. On one hand you want your title to be exciting and catch your viewers’ attention and on the other hand you would like that title to pick up on some long-tail keywords in the search engines. You can easily spend lots of time doing keyword research looking at search volume and trends for keyword phrases, but there’s still no guarantee that that’s what people are searching for. But….. 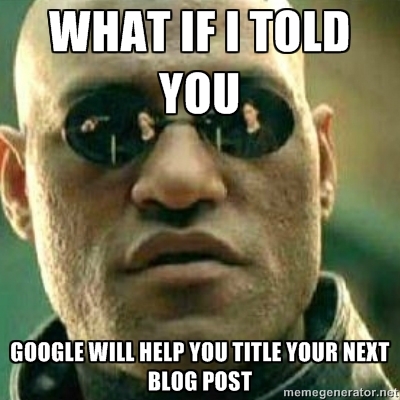 There is a much easier and quicker method to find the best title for you blog post – let Google do it for you. Simply go to Google and start typing any ideas you had for your blog post and STOP, don’t hit enter, do not pass go, and do not collect $200. Look at what suggestions Google lists below what you have typed; this is what people are actually searching for. Marrying the content you are writing with what people are searching for is a winning combination. There is one caveat here, if you title your post with one of these titles, your content better be very good. Apparently there’s a misconception out there that Oregonians hate Californians, I’ll be the first to attest that we do not hate Californians! Look at how Google added “do” into the suggestions this is helpful data because it points out that more people are searching for this with the word “do” in the search. In this example, it’s evident that there’s a higher volume of search for “Top 10…”. From this example we can see there’s a higher volume of search for lists, apparently people want to know an exact number of ways to get noticed at work. So, the next time your ready to hit publish, run your blog post’s title through Google to make sure you aren’t missing out on an opportunity for more traffic.